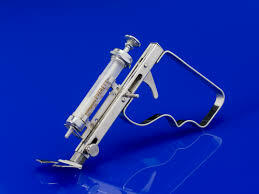 I bet any of you who inject insulin did not use this device in the distant past. I didn't either. Just insert the loaded syringe and pull the trigger. It kept you from having to manually push the needle into your body. I know many people were very squeamish about doing that. I used the old fashioned push method. This contraption looks much too scary! 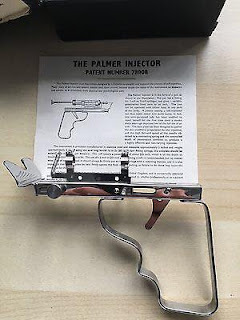 It is called the Palmer injector, invented in 1955.